The Shadow Jubilee clones have a beautiful facial speck pattern very nearly the same as their famous dam. Now, as they are mature, 4 of the 8 are over 90" like their dam in her senior years. Improvements in scientific cattle production have taken on several methods in the last 150 years. 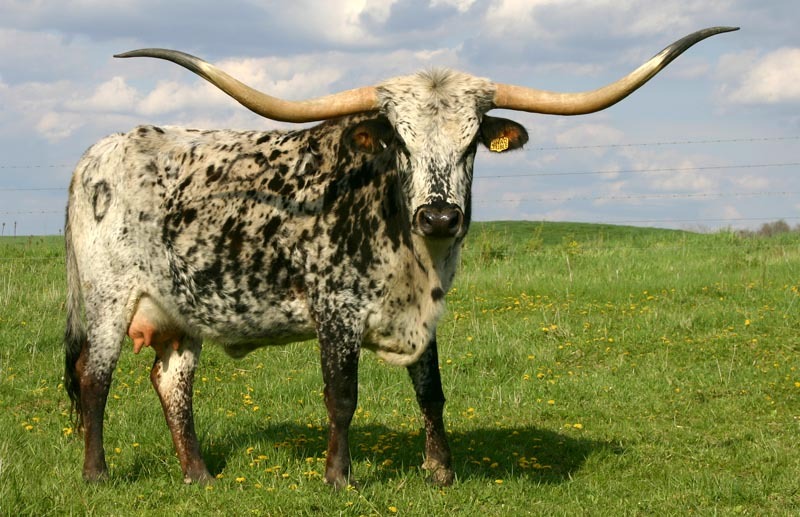 In 1860 Texas Longhorn bulls were selected for castration which were the larger, the most beefy and appeared to be the best thick specimens. All agreed (in 1860) that this science was a good management practice. Steers were allowed to develop then driven up the trails and sold. The best were steered and the poor quality bulls were left as herd sires. The open range herd evolved down to poorer and poorer specimens from this practice. This was recorded in the book, THE LONGHORNS, by Dobie. In the early forties artificial insemination, although controversial, provided great advantages for breed improvement. Since the use of AI the average dairy cow has doubled her daily milk production. This process is now universally used in nearly every nation and has assisted in improving the production of abundant human food products. In 1971 surgical embryo transfer science started. One famous scientist/embryologist removed two Simmental embryos from a famous cow in Canada, placed the embryos into a large tame female rabbit and personally flew them to Oklahoma for implanting. This resulted in one of the first full blood Simmental bulls born in the USA. This process was considered inhumane and many cows never produced again due to the surgical scar damage. In 1979 non surgical embryo transfer science quickly replaced surgical. Many feel the early eighties was the greatest breed improvement period of the bovine industry. In the mid eighties embryos were frozen which allowed them to be shipped in liquid nitrogen all over the world. This special scientific tool has placed unique genetics into the hands of successful producers of several species. As the above scientific procedures all came together, now replication cloning is a regular and reliable science. At this writing over 1000 clones of the leading producing milk cows, champion show steers, elite carcass steers, world champion bucking bulls and the longest horned Texas Longhorns now graze the earth. It is a special tool that has come of age. But, as in several other scientific advancements it too is not without it's critics, skeptics and controversial press. The God of the universe is all wisdom. Science is the truth and understanding of the facts of His microscopic intricate beautiful design. Deuteronomy, fifth book of the Pentateuch, 29-29 "The secret things belong unto the Lord our God; but those things which are revealed belong unto us and to our children forever......" As the Lord allows our best minds to move forward in scientific understanding, some will kick and scream and others will praise his precious name for allowing us to live at this time, and see the marvelous beauty of His handiwork. The following information gives accurate data on the cloning process. We would like to thank ViaGen for the preparation of this information. 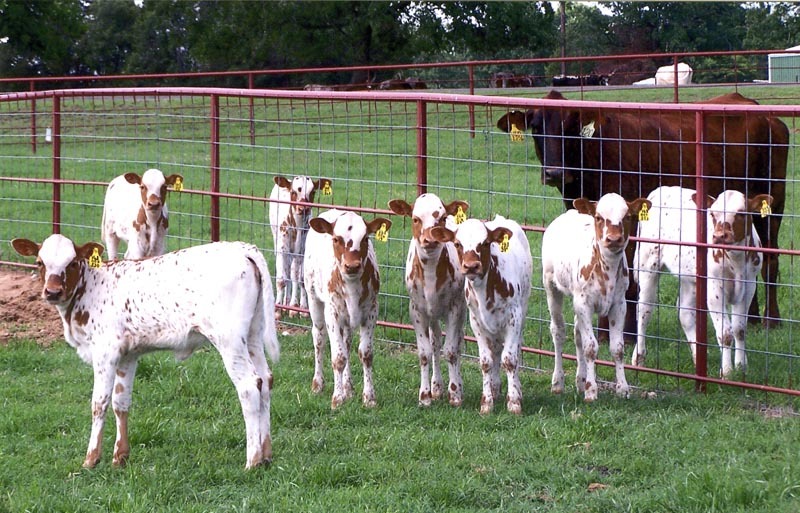 Thank you to Marquess Arrow Ranch for the use of clone donor and calf photos. Shadow Jubilee by The Shadow. Owned by Dickinson Cattle Co. Inc, Barnesville, Ohio. 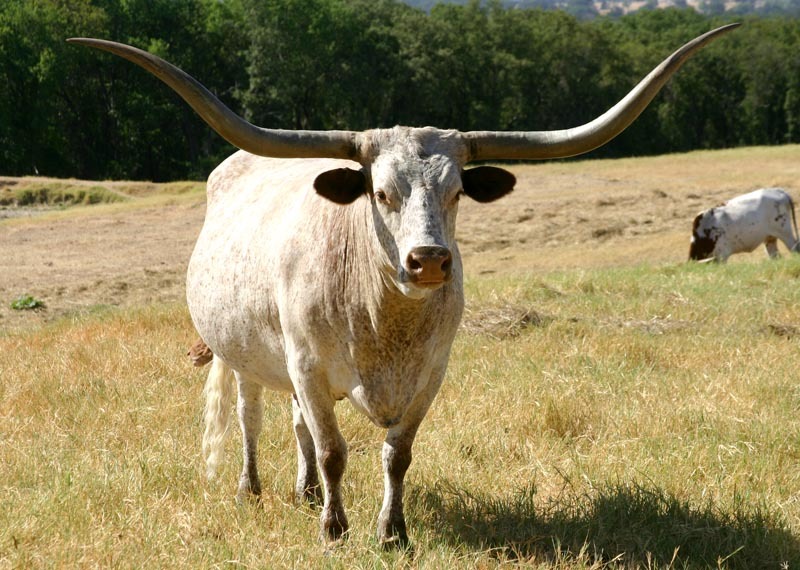 She is believed to be the fastest horn growing cow in Texas Longhorn history with 85-3/8" T2T. Scientific produced heifers from her cell line will be the treasure of the pasture. Measles Flower is pictured at 23 years. The use of her cell line was taken humanely and a number of replications are now in the industry. Although she is no longer an annual producer, her beautiful scientifically produced progeny will continue for a long and successful lifetime. These are 8 of the Measles Flower scientifically produced progeny. Please note the replication body style and near exact color patterns. As they get older the roan specks will develop exactly like Measles Flower. 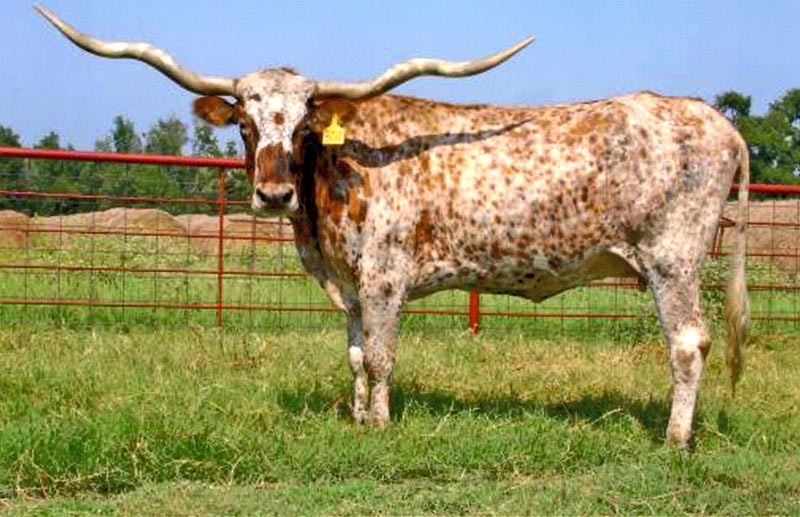 Starlight, owned by Dr. Zech Dameron III was the pioneer Texas Longhorn cow selected for replication. She and all her replicas are owned by Dr. Dameron. The Starlight replicas are all producing and their daughters will start calving in the next few months. The lid is placed on genetic bounce with replication, not breed improvement; but the consistency of replicas being equal to or no less in quality and consistency is the attraction to this process. The real replica value is the ability to turn back the clock even to the point of successfully replicating a replacement from a deceased critter.